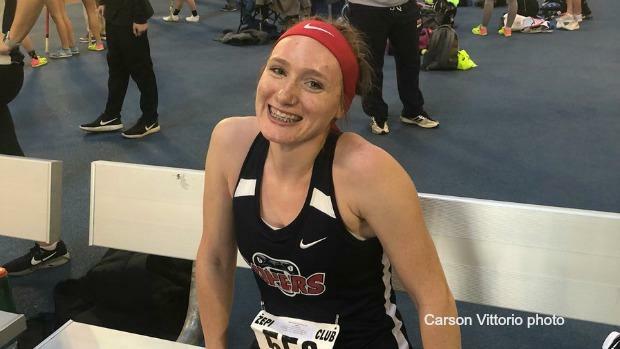 The annual Dorothy Dawson Invitational was a combination of pleasure and pain that took place at the University of Illinois Armory. The tremendously long event started at 8 am and culminated around 6 pm. The meet ran very slow as the average time between heats was about five minutes. This lead to a lot of the athletes warming up too early for their events, messing with some people's psyche for some but, we also saw athletes who seemed unaffected. Hunter Hendershot of Mahomet-Seymour held off Gavin Beverage who traveled from West Virginia in the 17-18 boys shot put. Hendershot was a bit off from his 56-4 mark from the Ted Haydon Invite but still threw a solid 55-5.75. Beverage dropped a WV#1 with a 54-6.50. Serena Bolden of Springfield Southeast improved a bit more from her 17-9 performance at Ted Haydon in the long jump with a new IL#4 18-1. Bolden may have gotten lucky though as Lovie Annafi of Chicago Whitney Young had a 17-0 jump that was about a foot behind the board. If she hit that board, it could have been a 19 footer, 18 something for sure. Bolden still had to knock off a bit of rust in the triple jump after scratching all her attempts at Ted Haydon. She took 2nd place in the 17-18 age group with a 36-6.25 as Daryn Davis of Huntley continued her very strong start to the year with a 37-2.25. Moving from the horizontal jumps to the vertical jumps, Kenli Nettles of Arthur won the 17-18 girls high jump with a 5-3. It was only her second jump of the day, beating 5-7 jumper Sarah Flight of Charleston who only jumped a 5-1 here. On the boys' side, Alex Babbington of Plainfield East continued to start his season strong with another win in the high jump. His mark was a bit short of his current IL#1 mark of 6-6 as he hit a 6-4.75 here. The pole vault may have been the best event of the day. The 15-16 girls pole vault was very strong as we saw two sophomores, Rhiannon Held of Mt. Zion and Kolby Weiss of Clinton, both vault 12-0.75, with Held getting the win on less missed attempts. Both girls now sit atop the ranks in the state. Landis Brandon of Monticello had a huge win over last years 1A state champion, Windsor Roberts of Tri-Valley, with an 11-7 while Roberts hit an 11-1 in her season opener. Chandlar Ifft of Prairie Central started his 2019 campaign the same way he ended his 2018 campaign... with a win. Ifft vaulted a 15-3 to beat a stacked field including the likes of Cameron Witts of Williamsville, Liam McGill of Bloomington, and Garret Bachtold of Paxton-Buckley-Loda. Amari Brown of Milwaukee Rufus King continued to show why she is one of the top sprinters in the nation destroying her competition in the 60m and 200m. Her times were not her best as she was not tested. She ran a 7.67 in the 60m to win by .17 of a second over Bolden and a 25.26 in the 200m to beat Kyra Ozier of DeKalb by 1.08 seconds. We saw a possible freshman star in Aidan Laughery of Gibson City-Melvin-Sibley who dropped some blazing times with a 7.16 in the 60m and a 52.79 in the 400m. Laughery tore up the IESA scene with 4 state championships and beating Tate Walcott's Class 8A 200m State Meet Record with a 23.28. He just finished up his football season a few weeks ago as part of Gibson City-Melvin-Sibley's State Championship football squad. He looks to be a force in the Class 1A for the next four years. Mason Barr of Ridgeview really looked as if he came into the meet to prove something dropping some very impressive marks. He ran a new IL#1 in the 60H with an 8.26 which was only .08 from his PR and almost an entire second faster than what he ran at this meet last year. He took 2nd place in the 400m with a 51.34 only getting bested by vipers teammate, Quemarii Williams of Danville who ran a solid 50.72. Barr wrapped up his day by taking 4th place in the 200m with a 23.34. Kayla Walters of Bolingbrook continued her great start in the early going, running a new PR of 8.80 and beating the defending state champion, Kaylah McCall of Homewood-Flossmoor in the process. She followed that up by running another PR in the 60m of 8.00 and a solid triple jump of 35-8.75. Matthew Meinke of Neenah all the way up in Wisconsin came down for a rust buster in the 3000m with an 8:53.59. Meinke wrapped up his 2018 xc just a little over a month ago with a 34th place performance at NXN, which lead people to wonder why he was coming down to Illinois to race? It was because it was the closest meet and he has a love for the armory. Meinke showed great sportsmanship, waiting for everyone to cross the finish line and tell them good job. Jayla Campbell of Rich Central dropped a new 17-18 age group meet record in the 400m, dropping a 57.71. The star runner came through strong and never looked back as she won by about four seconds. She also had a great showing in the 60m dropping a 6.99.